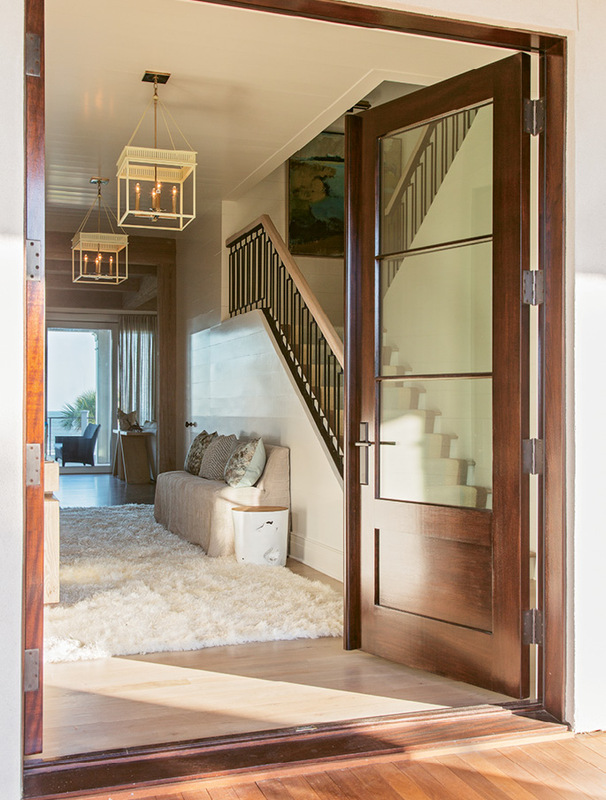 Upon stepping through the front door, guests are greeted with a direct shot to the back of the house, where a wall of windows provides ocean views. 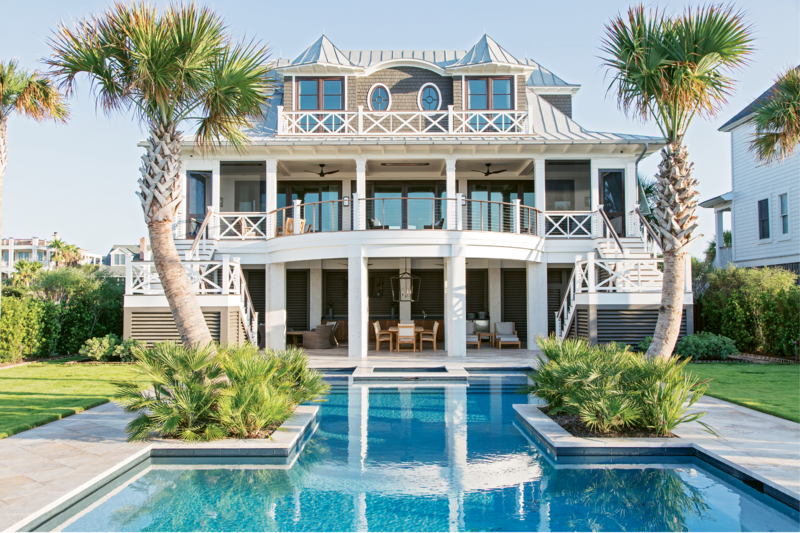 Beachside Oasis: Homeowners Mike and Mary Lamach worked with architect Steve Herlong and interior designer David Smith to conjure their vacation home; the symmetrical design is influenced by both Caribbean and Lowcountry architecture. White leather chairs by Lee Industries flank the kitchen table, which can expand to accommodate 14. Vintage Charm: In the laundry room, walnut accents and a vintage-inspired Urban Electric light fixture set a nostalgic tone. Come On Over: Two sofas plus an assortment of armchairs and poufs means there’s plenty of room for large groups, so Mike and Mary, who both hail from Michigan, are always ready to welcome extended family. 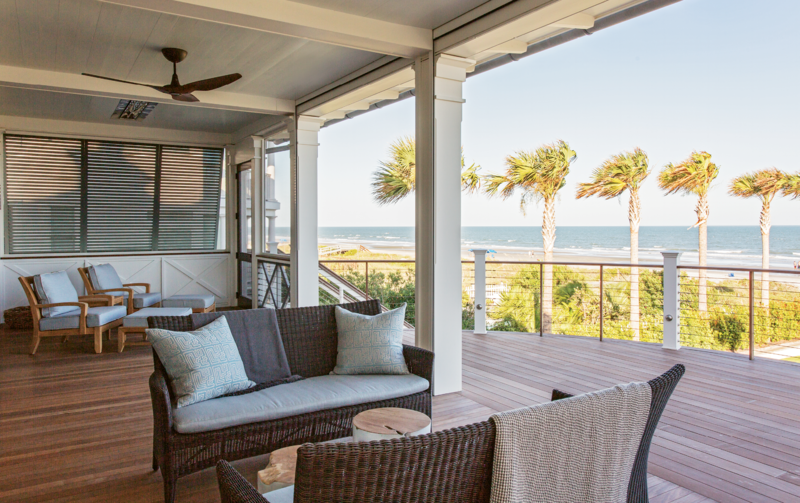 Kingsley Bate furnishings make this second-floor oceanfront patio feel like an extension of the family room. 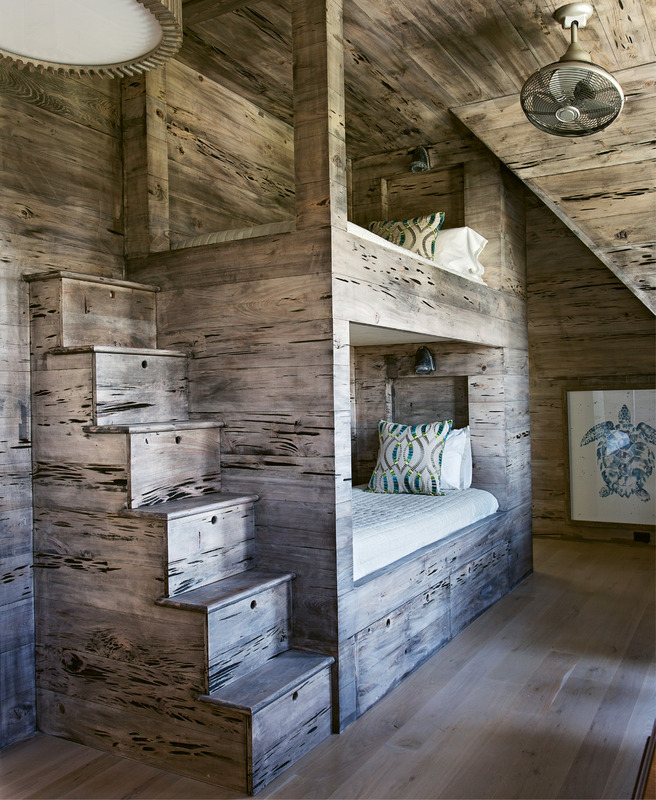 Pecky cypress walls warm up the bunk room, which boasts four beds and two en suite baths. 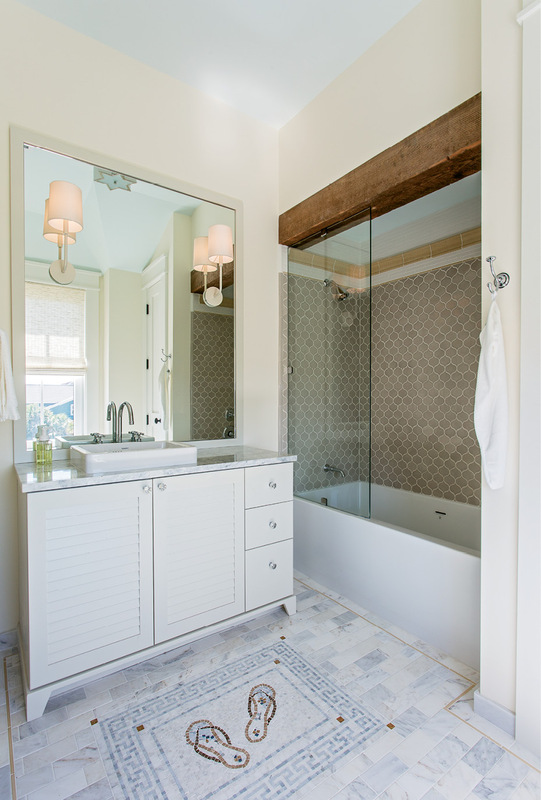 It’s In the Details: A vintage wood beam and a tile floor embellished with a custom flip-flop mosaic add personality to this bath. 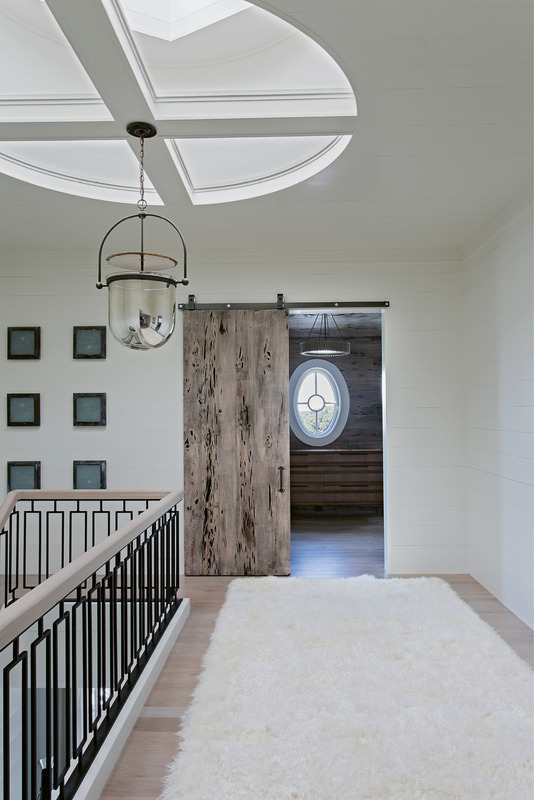 Haute Hallway: A medallion-shaped skylight presides over this second-floor hallway with a custom stair rail designed by David Smith. 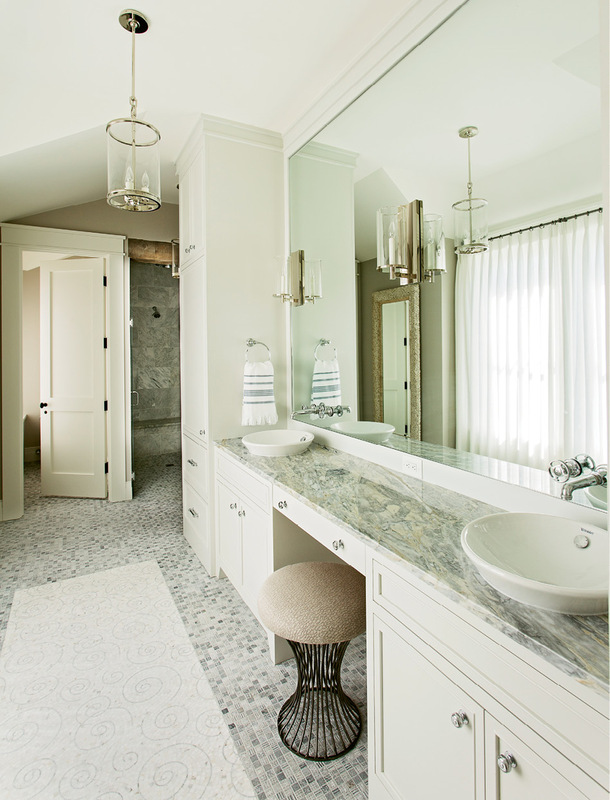 Waterworks fixtures and a Walker Zanger mosaic marble tile floor set an elegant tone in this bath. 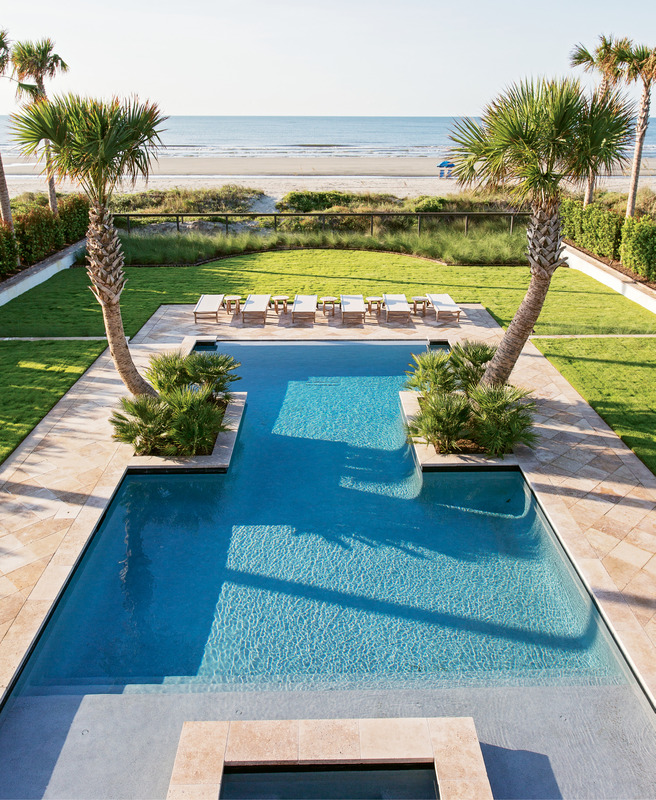 An I-shaped pool, mirror-image palmetto trees, and luxe Kingsley Bate patio loungers mean the Lamachs’ own yard provides a view that rivals the nearby ocean. 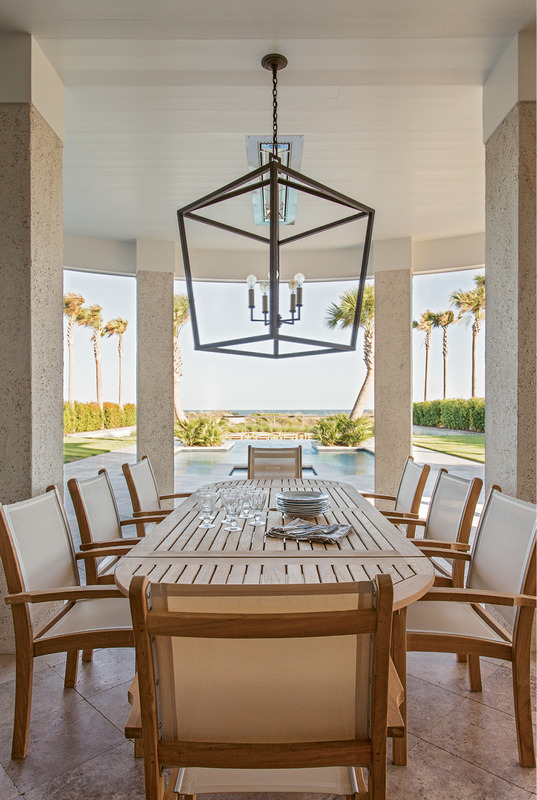 The View from Here: A teak dining table and Currey and Company light fixture set the stage for elegant outdoor dining. PHOTO: Beachside Oasis - Homeowners Mike and Mary Lamach worked with architect Steve Herlong and interior designer David Smith to conjure their vacation home; the symmetrical design is influenced by both Caribbean and Lowcountry architecture. On an idyllic stretch of shore near the southern end of Isle of Palms stands a stunning symmetrical abode with an architecture style that tips its hat to both Lowcountry and Caribbean traditions—a winning combination that, for homeowners Mike and Mary Lamach, provides the ideal backdrop for relaxing at the beach in the company of family and friends. The 4,700-square-foot, five-bedroom vacation home, complete with a bunk room, was made for entertaining large groups: the expandable kitchen table can seat up to 14 people, and the living room, which adjoins the kitchen, accommodates more than a dozen around two conversation-height coffee tables that can do double duty for casual dining. Outside, a covered patio with an alfresco kitchen offers seating for another dozen or so guests; beyond that, a large I-shaped pool beckons. For Mike, a manufacturing exec, and Mary, a retired school teacher, more is definitely merrier: the Michigan natives feel most at home here reconnecting with their three grown sons, Nicholas, Jaime, and Michael—and Michael’s wife, Nicole—or hosting a group of extended family and friends from the Midwest. And the house should fit their needs for many years to come: thanks to smart additions like the bunk room, which sleeps four and offers his-and-her en suite baths, there’s plenty of room for future grandchildren, grandnieces, and grandnephews. “We thought about where we might be in five and 10 years and designed with that in mind, so everyone will still be comfy,” Mary says. They’re perfectly comfy today, too, especially on holidays, like the Fourth of July, when they love to host a big bash. Mike might fire up the Big Green Egg to turn out ribs or beef tenderloin; Mary might whip up coleslaw and baked beans to serve along with it. With country music piping through the wireless sound system; close family and friends milling about; and their boat, Hail Mary, bobbing in the water nearby, the Charlotte-based couple couldn’t ask for a better home-away-from-home—just a three-and-a-half-hour drive from their primary residence on Lake Norman. When Mike and Mary bought the waterfront lot, they set out to meld their love of Caribbean-style architecture with an aesthetic that felt more at home in the South. They tapped architect Steve Herlong and North Carolina-based interior designer David Smith, who also outfitted their primary residence, to help bring their vision to life. Mirroring design elements—such as twin dormers, a front entrance with a double-sided staircase, and a symmetrical I-shaped pool flanked by parallel palmettos and native plants selected by landscape architect Sheila Wertimer—lend the abode a classical sensibility that reflects this heritage. But the home’s formal elements are tempered by “organic and relaxed materials, like those locally available in the islands,” Herlong says. In that vein, elements such as a zinc-coated copper roof and cedar shingles keep things grounded and strengthen the house’s connection with the natural landscape. When selecting paint colors, furnishings, and textiles, Smith paired those warm wood accents with a soft coastal palette—think white linen Verellen sofas in the living room, white leather Lee Industries dining chairs in the kitchen, and a white Angora rug in the foyer. 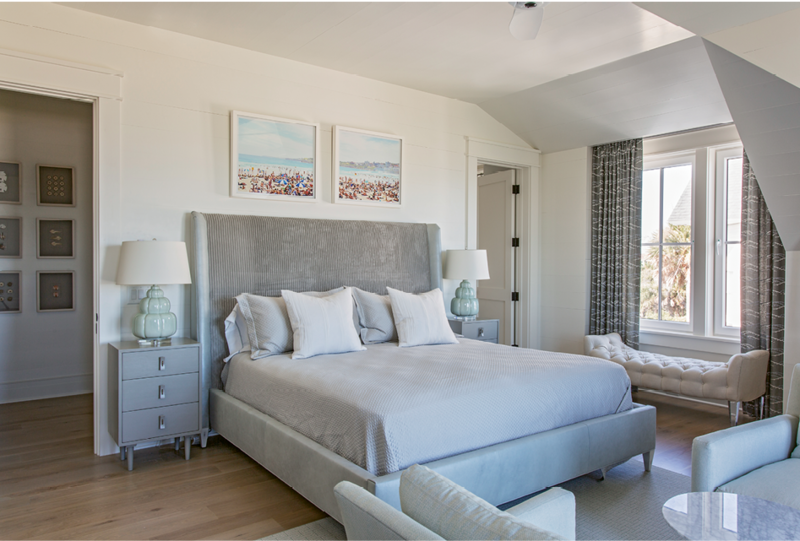 A few pops of color, like a Hickory Chair seat covered in a blue Moroccan-influenced fabric in the living room and a Trowbridge Gallery print in a guest room, add visual interest without straying from the theme.